Nations Press feature news AWKWARD MOMENT? Pres. Duterte meets Vice Pres. Robredo for the First time! AWKWARD MOMENT? Pres. Duterte meets Vice Pres. Robredo for the First time! 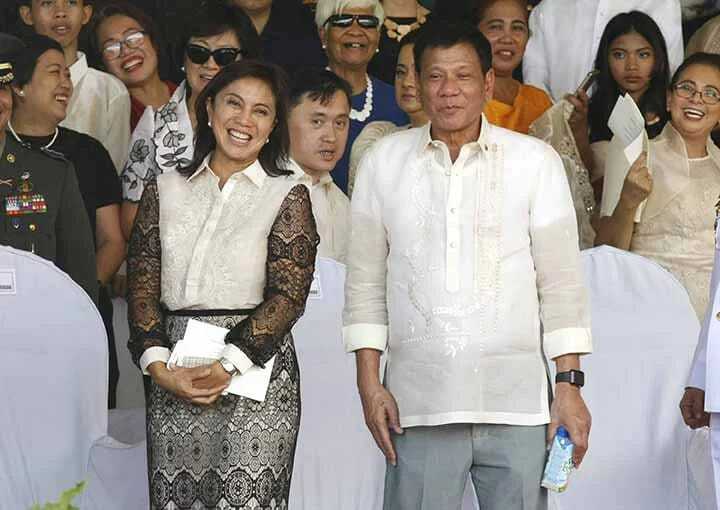 SPONSORED LINKS President Rodrigo Roa Durterte and Vice President Leni Robredo finally met at the turnover rites of the Armed Forces of the Philippines. The much anticipated meeting of Philippines’ top leaders finally happened. While the two are cordial upon their first meeting, there is awkwardness in the air as the two sit a chair apart. In between them was outgoing Acting Chief of Staff Lt. Gen. Glorioso Miranda. “This is the first time that I meet you personally,” Duterte said when he acknowledged Robredo at the start of his speech. “I would have preferred to be seated beside you but nandyan si defense, e,” he joked causing laughter. There is awkwardness and an invisible wall between the two leaders. Duterte and Robredo are from opposing political parties that pitted against each other for national positions. After the polls, Robredo expressed her desire to meet President Duterte. Even during the elections, Robredo said that she will offer her full support to the new president.